RJC Yacht Sales & Charter sell the 123′ Oceanco, CAPRICE! Bob Cury of RJC Yacht Sales is pleased to announce the closing yesterday of his central agency, the 123′ Oceanco Motoryacht, CAPRICE, representing both buyer and seller. CAPRICE is an ABS, A1 and AMS classed Oceanco MY, launched in 1994 and built to a design by the late Gerhard Gilgenast. 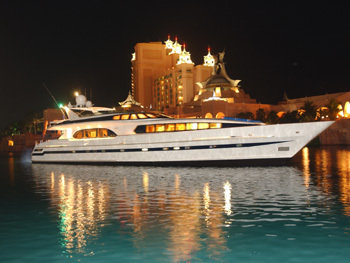 Accommodations are for eight guests in four luxurious staterooms. She was refitted in 2005 along with constant upgrades and new equipment through the years. Her voluminous custom Donald Starkey interior is high gloss maple joinery and she features a large main saloon with a bar and entertainment system plus a formal dining area. Alfresco dining is available on the flybridge, which also has tender storage. She is powered by twin Deutz 1350HP engines giving her a range of 2,500 nautical miles at 15 knots. Her name will remain CAPRICE and the owner’s plan to complete a new interior refit prior to cruising in the New Year. CAPRICE was asking $2,495,000. RJC Yacht Sales & Charter Bring to Close Another Successful Fort Lauderdale Boat Show! Fall certainly showed her face during this year’s Fort Lauderdale Boat Show and made for a spectacular and pleasant setting for owners and prospective owners to come check out the floating inventory. Clear blue cloudless skies and highs of 75 degrees made the weather the topic of most conversations. Only one quick rain shower passed through to briefly leave behind work for crew and their chamois, but after the storm this perfect rainbow arc formed directly over the four tri-decks in our display on the face-dock of the Pier 66 Marina! After five great days of show festivities, we are grateful for the wonderful amount of activity we received and all the expressed interest in our yachts on display. RJC Yacht Sales is certainly looking forward to announcing post-show sales news soon!